Many children now spend a majority of their time indoors, staring at TVs, computers and cell phones. They grow up bombarded by visual and auditory chaos, and may find themselves at a loss without that constant stimulation. In contrast, a garden feeds all the senses. Spending time in the garden can awaken the senses of touch, smell, and taste, and attune a child to the subtler sights and sounds of nature. And while electronics and the Internet provide limitless opportunities for making connections, communication is often done in the digital realm, usually with peers of similar backgrounds and interests. Children miss out on practicing face-to-face cooperation, problem-solving and conflict resolution, especially with those outside their virtual social circle. The garden offers a much-needed antidote by nurturing life skills that can help heal this fractured world. 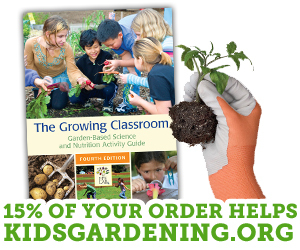 Gardening helps kids connect with each other. Research shows that young people are increasingly experiencing feelings of loneliness and isolation — even the kids with hundreds of virtual "friends." Research also indicates a growing gap in our youth's ability to interact with people from different backgrounds. With a future grounded in a global economy and communities becoming more culturally diverse, it's imperative that children have opportunities to spend productive, enjoyable, in-person time with diverse populations. Gardening helps kids connect with nature. Parents are increasingly wary of letting kids spend unstructured time outdoors, and many kids are reluctant to do so anyway. However, being exposed early, and often, to the beauty and wonders of the natural world fosters a connection to nature and helps ground them in their sense of belonging to the larger world. Gardening is a perfect gateway, by bringing a tamed nature into their lives. Kids — and adults — can experience and appreciate its wonder, without the fears many have of the dangers of the wild. Spending time in nature helps kids feel more connected to their physical bodies, which can help them stay grounded in times of chaos. And an appreciation of nature is the first step in teaching children the vital role each of us can play in the stewardship of natural areas, both in their communities and around the globe. A garden that is truly accessible is a special learning place for all children. This includes kids with physical limitations, but also other youth who may feel challenged and marginalized in traditional classroom settings. A dream garden is one where every child can shine! Kids with limited mobility. Designing gardens with wide, smooth paths, gentle slopes, and plants at heights children can reach allows kids in wheelchairs and other movement aids to participate fully in all the garden has to offer. More information: How to Create an Accessible Garden for Those with Physical Limitations. Kids from different cultural backgrounds. Gardens present an ideal environment for cultural inclusivity. For example, you can invite each child to write down a list the vegetables and fruits they eat at home. Collect the lists and note any regional and international foods, and then try to incorporate some of the crops into your garden. These foods may be unusual to many of the kids in the class, but they will bring the flavor of home to those whose grew up with them. They may also spark curiosity and interaction between kids. Kids with different sensory sensitivities. Some children may become overwhelmed or feel uncomfortable speaking up in a boisterous setting. Or they may feel overwhelmed and overlooked during the chaos of a large group project. By incorporating special "retreat" areas, you'll create quieter spots for the one-on-one and small-group conversations and activities that let quieter kids participate and more fully enjoy all the garden has to offer. Read Designing Garden Programs for All, which includes a section on gardening with children with autism. Kids with different activity needs. Some kids love to be extra active and enjoy being outdoors, but they don't enjoy competitive sports. These kids may especially enjoy the physical activities of shoveling soil, making trips to and from the garden shed to retrieve tools and supplies, and doing any of the more active gardening tasks. Gardening offers opportunities for activity that fosters cooperation, rather than competition.